Yeah, enjoy. Art Rage 2 as per usual. Ristar needs to be revived for current gen. I'd buy the hell out of ristar on XBLA or Wiiu eShop. Good job! I use Art Rage 2,too! May I use this for a Cosmic Pony, please? I absolutely love the tunnel feeling that you given space, it adds an enormous amount to this piece. Someone should make a group about Ristar! 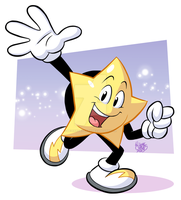 I would love to see a new Ristar game! Too bad that such a great game like ristar isn't popular. I love that soft color you put and ristar's happy face! So great. Ristar needs more love! Ristar was in my opinion one of the most under-rated games of all time. Why can't sega make a game with the quality of this one again? WHY!? Ver cool Ristar wallpaper...I used it on my computer! Ristar deserves more snazzy wallpapers like this. Oooo, this guy is so cute! its a shame i never got to play this. but i still know this guy! i love this! Oh wow, someone else in the world knows Ristar! This is awesome. It's not everyday we see Ristar art! Dood. this is my wallpaper as of right now. Sorry, I lack good commenting skills tonight.